4 or more payment types increases the success of a transaction by 22%. Customers are increasingly expecting choice when paying online, with 50% abandoning a transaction because their preferred payment method isn’t available. Preferred payment options include electronic bank transfers, vouchers, e-wallets (PayPal) and other payment methods. 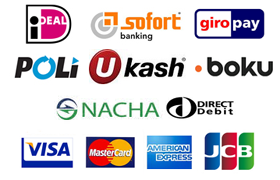 The below payment methods are designed to run along side your card options.